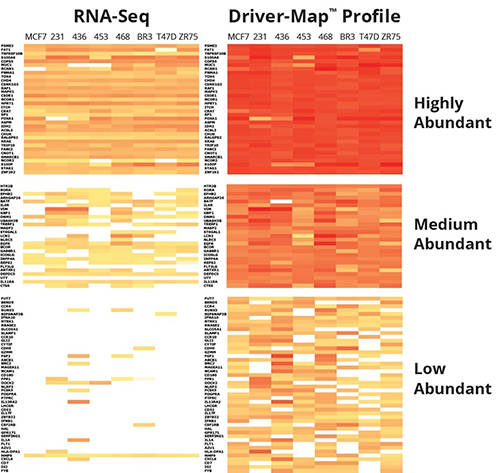 The new Driver-Map™ Human Genome-Wide Gene Expression Profiling kit, is a targeted RNA expression profiling assay designed to easily provide a molecular snapshot of all known 19,000 human protein-coding genes from complex samples starting from as little as 10 pg of total RNA. The multiplex RT-PCR-based, followed by next-generation sequencing (NGS) method used in the kit allows researchers access to the specially designed and experimentally validated gene-specific primer pairs to run samples in their own laboratories. The assay includes selective amplification of 19,000 annotated human transcripts using RT-PCR; experimentally validated GCA-rich primers to specifically measures mRNAs without background from other RNAs; and built-in, internal ERCC control RNAs to compensate for batch effects and other technical variation.